The stench of hypocrisy and the reek of duplicity remain alive and well with the EU and its camp followers. A trade war beckons between the European Union and the United States but there can only be one guilty party, one side responsible, and to the EU Customs Union and its willing cheerleaders in the BBC that has to be the United States in general and President Trump in particular, despite evidence to the contrary. In a flagrant attempt to paint President Trump as the international bad guy the EU Commission’s President Jean-Claude Juncker talks tough by announcing how his Customs Union will raise tariffs on particular U.S. goods — while intentionally ignoring how EU tariffs already punish US imports. The BBC, unable to resist a pitch that demonises President Trump, swallows the EU narrative whole and encourages the British Prime Minister to take the EU’s side. If ever we needed a further example of why the UK should get out of the EU and its pernicious Customs Union, this looming trade war is it. When President Trump points to examples of how the U.S. has lost out from previous trade deals by accepting higher import tariffs for its exports than it sets itself he is merely stating the facts. While lowering tariffs across the world has undoubtedly encouraged greater world trade that has spread prosperity far beyond anything government foreign aid accomplishes, it does not mean that all free trade deals have been free and fair or good for the U.S. The reason for that lies with past U.S. administrations, not President Trump. So when Donald Trump comes along and warns in his election campaign that he will tackle what he sees as unfairness to American workers who have lost jobs no-one should be shocked that he takes action. That his newly announced steel and aluminium tariffs – designed in particular to target Chinese steel dumping – will also hit EU continental steel and aluminium exporters has brought the wrong response from Juncker. Rather than announce an aggressive retaliatory response with threats against U.S. brands such as Levis jeans, Bourbon whiskies and Harley Davidson motorcycles, Juncker should be recognising the EU’s existing high tariffs could be reduced as a trade for avoiding the new steel tariffs. 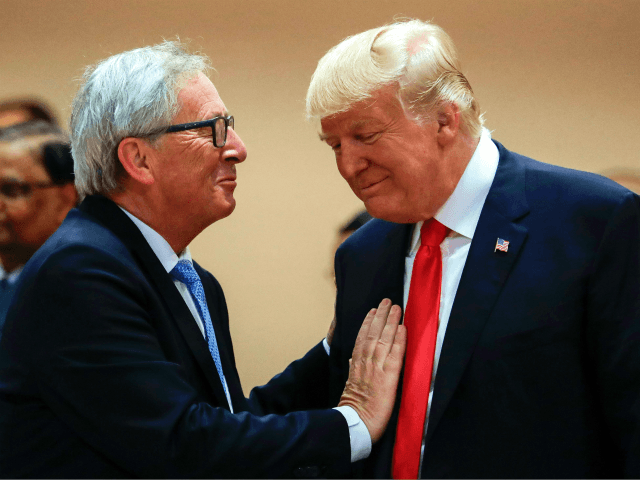 Instead, Juncker appears to have fallen into a trap where Trump can now quite properly justify further tariffs against EU car imports that only attract a U.S. tariff of 2.5 per cent — compared to the EU’s tariff on U.S. cars of 10 per cent. The U.S. represents 15.7 per cent of UK car exports and an increased U.S. car import tariff would likely damage UK exports. Once out of the EU’s Customs Union the UK could of course unilaterally reduce its own import tariff on U.S. cars and agree a deal where the tariffs are equalized at the lowest possible rate. Alternatively, if the UK leaves the EU but stays in the Customs Union, its trade policies would be dictated by the likes of Juncker and it would be caught in any tariff war. The UK would face higher U.S. tariffs for its exports and UK consumers would have to pay more for U.S. products we value and want. On the BBC’s Marr Show the British prime minister Theresa May was pressurised to condemn President Trump’s actions, which she sidestepped, but later she put in a call to the White House appealing for the administration’s proposed tariff increases to be avoided. A trade war with the UK’s largest single export market would only damage the UK and leave us with no say in how to resolve it. Leaving the EU and its extremely protectionist Customs Union must, therefore, be our priority. The greatest enemy of tariff reduction is not the United States or Donald Trump but the protectionist European Union. Time after time at the WTO trade negotiations the EU has dragged its feet and in sectors such as cars or agriculture maintained higher tariffs than its own exporters enjoy. The EU’s detached elite is singularly unaware of the poverty their customs fortress contributes to around the world – including even sections of U.S. society – so we should be grateful to President Trump that he is calling them out and seeking to establish free trade that is equitable to everyone.